(August 4, 1859 - February 19, 1952) was a major Norwegian writer. He won the Nobel Prize for Literature in 1920. He published more than 20 novels. Hamsun argued that the objective of modernist literature should be the intricacies of the human mind, the "whisper of blood, and the pleading of bone marrow". He was a leading figure of the Neo-Romantic revolt, with works such as Hunger (1890), Mysteries (1892), Pan (1894), and Victoria (1898). 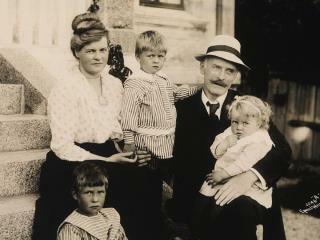 Hamsun is considered to be one of the most influential and innovative writers of the past century. He pioneered psychological literature using stream of consciousness and interior monologue, influencing authors such as Franz Kafka, Henry Miller, and Ernest Hemingway.